One of the reasons I do what I do is to have the freedom to spend more time with my kids. I work from home, so I either say goodbye to them as they leave for school or I walk with them to school. On three days of the week when they come home, I’m the only parent there as my wife works on those days. Before establishing my rule of ending my workday at 2:30 pm on those days, I’d let them do their thing when they got home while I did mine. Then I realized I was giving away some of the freedom I have by not spending time with them on those days. And that’s why I put that rule in place. Before I created that rule for myself, I had been using The NOW Year™ Method element of theming my days. (Want to know more about theming? Click here to read a more specific description of the theming process.) This approach works terrifically for me. In fact, I’d say that whether you work from home or not, theming your days can go a long way to making any father a better one. Best of all, it isn’t hard to do. 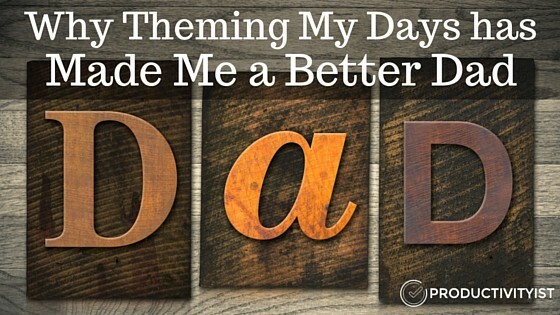 Here are three things I’ve noticed since theming my days that have played a role in making me a better dad. Prior to theming my days – which gives them an overarching focus – I would dig into my to do list to see what needed doing. I would work by project or mode (and when necessary, schedule). As a result, each day had a lot of tasks to go over. Once I started adding daily theming to the mix, the tasks that were associated with those themes gradually aligned with the corresponding day of the week. Now I simply look at my task app. Knowing what the day “means” to me allows me to get the things I need and want to accomplish without seeing undetermined “ought to do” items on a to do list. As a result, I have less decision fatigue and even have more energy when I spend time with my kids. I wrap up every day by deciding on My 3 Absolutes for the next day and they are now associated with the theme of the next day every single time. This helps me go to bed with fewer (if any) thoughts racing through my head when it hits the pillow in the wee hours of the morning (usually around 1 a.m.). If you’ve been reading my past work, you know I’m not a morning person. I’ve even created a small product to help people who are wired like me in this area. One of the benefits of earmarking each day of the week with a theme is that when I wake up in the morning (around 8 a.m.) I may not know what I need or want to do in detail, but I know what day of the week it is. Since I assign each day a theme, my mind automatically knows what the overarching focus for the day is with absolute certainty. This provides me with an increased level of focus for the day ahead and allows me to move forward with purpose and precision. I waste less time figuring out what lies ahead, and it allows me to get straight to work and be present for my family when the workday comes to a close. In my experience, the simpler things are, the easier they are to comprehend. That doesn’t mean they’re easy to do; simple and easy hold very different meanings in my book. But if you can simplify things (such as processes) then things can get easier over time. And I’ve found that to be the case because of how I’ve themed my days. I’m not wasting as much energy going through my day because I’ve categorized it with a specific focus and then I bookend the day with my morning and evening routines. The only part of the day that is essentially “different” is the middle. The themes minimize that by pulling me towards an overarching focus instead of bouncing all over the place. All of this means I can deal with day more effectively and efficiently. I can also spend more time with my kids before, after, and (when appropriate) during the workday. There are other benefits to this theming process that have helped make me a better dad (and parent) such as teaching my kids about how powerful rituals can be. Theming allows me to shape my year and my business in a way that matches the school year. I didn’t start theming my days (and months) with the intent of bettering myself as a father, but it somehow worked out that way. And I’m happy that it did.